Inexpensive Reflective Backpacks, Personalized in Bulk with Custom Imprint or Blank. Promotional, Lowest prices in the USA and Canada. Fast Delivery. Inexpensive Bulk Reflective Drawstring Backpacks, a.k.a. Drawstring Sports Packs, made of sturdy 110 Gram Non-Woven, Coated Water Resistant Material, with top and bottom reflective stripes for traffic safety and contrasting black trim at the top and bottom. It may be carried over the shoulder or as a backpack. Bargain Prices for the USA and Canada for bulk reflective backpacks. 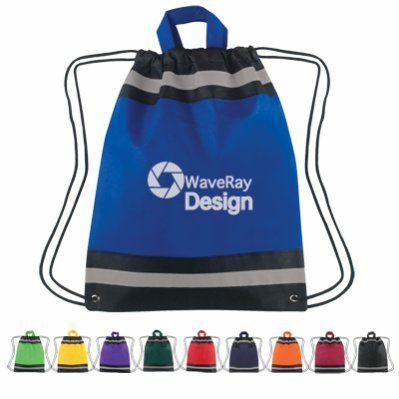 Please note that our bulk drawstring backpacks are made of the sturdiest non-woven fabric available: the 110 gram density is way superior to the 75 gram of our competitors. Free artwork design. We will send you a proof for your approval before production. We also supply not imprinted (blank) reflective drawstring backpack bags. We supply two sizes of reflective backpacks: HT_3373, a smaller 13" x 16" reflective backpack, and HT_3371, a large 17"x20" reflective backpack.